Whether you succeed or fail, the map is the same. Where you want to be, and where you are now are always on the map. Whether you can move from one to the other depends on a few well-thought-out considerations. Let’s look at a simple map that can be used in a lot of the leadership challenges executives face. The formula for success is simple, but not easy to implement. Let’s look at it again more closely. 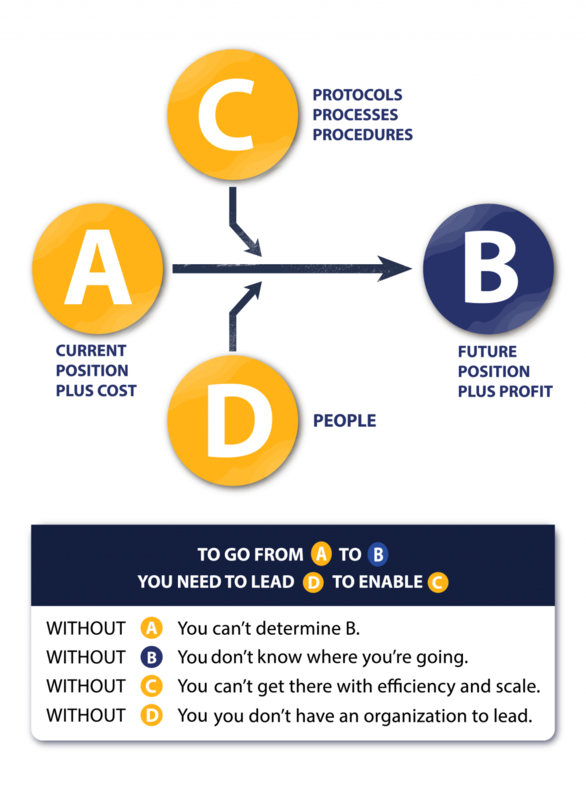 So, to make the journey from your current position, with all its costs, to your future position, your vision, with all its profits, you need to be able to lead people, who have bought into your vision, and YOU, and who will now activate and enable the protocols, processes and procedures that are necessary to make that vision become a reality. If this is true, then what the best leaders want to know, is how do they lead people so that the rest can happen? The honest answer is not the one that people usually give in the first instance. They are afraid that it will put people off. But the truth doesn’t change just because we like it, or don’t like it. It is, by definition, the truth. The answers that are usually given to this question are technical, skill-based, learn-how-to responses. This is deemed to be safe because it takes the focus off the leader, and puts it onto something that they need to learn to do. In over 20 years of helping leaders, this is rarely the solution. The truth, the honest answer to the question posed above, is that leaders will know how to lead others, when they have learned to lead themselves. With people, a leader can only see into another person, the same distance that they can see into themselves. No matter how good your grasp of your current position and financials is, or how clear your vision and projected profits, and how reliable your protocols, processes, and procedures might be, unless you have taken the time to truly find the things inside you that are distorting your judgements of the outside world, you simply cannot make any decisions about other people that you can rely on. If you still just want to get the work done, and secretly wish you didn’t have to put up with people, although at one time the rigidity of organisational structure may have protected this view from becoming public, we are now in an era that demands complete transparency. The hierarchical pyramidal structure that characterised most organisations in the past, has now been squashed flat, into an equal network of people, comprised of nodes of leadership, who are all playing different roles, to make the greater whole happen. Mutual respect and appreciation, precision and clarity must define all work relationships in the network of success. If you are feeling frustrated, and find yourself, or others in your organisation, judging each other, providing solutions without having really having listened for what the actual problem is, or deliberately avoiding real issues just because they are difficult to deal with, then this is poison to your network of leadership that you rely on to succeed, and more importantly to make a contribution of any significance.